Sony KDL-40HX803 review | What Hi-Fi? When is a 3D TV not a 3D TV? When it needs even more money, in addition to the not-inconsiderable list price, thrown at it to release its latent 3D-ism, that's when. And, in the case of this Sony KDL-40HX803, your additional spending extends even further than the cost of 3D glasses we've railed against when reviewing other manufacturers' 3D screens. This set requires a separate 3D transmitter to synchronise the screen with your 3D glasses: it's a 15cm slim bar that sits in front of the TV, the TMR-BR100, and costs £50. The TDG-BR100 3D specs are £100 a pair on top of that, and the child-sized TDG-BR50 child-sized specs will ell for around £50 each. Still, we don't think any potential customer, least of all those sensible enough to dip into What Hi-Fi? Sound and Vision for sage buying advice, will spend this sort of money on a new telly simply because it's a 3D model. The majority of viewing is going to be plain 2D, after all, and if a TV doesn't impress in this respect it's not going to be a realistic proposition. It's a pleasure to report, then, that the KDL-40HX803 is among the most accomplished LCDs of this size we've ever seen, price notwithstanding. First of all, it's a good-looking device – it's not the slimmest around but it manages to present as both robust and delicate all at once. Specification is as long as your arm – edge-lit LED backlighting, 200Hz motion processing, Freeview HD tuner, wi-fi capability (with an optional dongle) for rapid access to myriad online services, and so forth – and ergonomics, both in terms of on-screen menus and remote control, are the usual Sony models of clarity and good sense. The standard-definition off-air TV pictures this screen receives are crisply detailed, with movement solidly handled and a wide-ranging colour palette. The Sony does especially good work with skin tones, while even complex patterns and shades cause few alarms. Switch to BBC HD or ITV HD and the improvements are obvious, with detail levels heading roofwards and edges, textures and the like impeccably realised. The 803's a confident upscaler of DVD pictures, repressing picture noise well and offering good levels of black-tone detail, even while keeping white shades crisp and clean. Gamers, too, have nothing to fear from the Sony's picture – it's fast and responsive in all circumstances. Blu-ray images are among the best we've seen from a mainstream product. The detail levels the Sony reveals in Avatar are simply prodigious, and in every other significant respect – motion, contrast, black levels, colour neutrality, you name it – the HX803 is equally accomplished. Once properly equipped to deliver 3D pictures, and hooked up to Sony's own BDP-S570 3D Blu-ray player, this TV (mostly) impresses all over again. Cloudy With A Chance Of Meatballs is unquestionably three-dimensional, and the effect is less optically stressful and more visually stable than that managed by some competitors' products. Thankfully, the glasses are comfortable, and big enough to fit over all but Dame Edna-sized spectacles. There's a downside, though – the inherent dimness of 3D images (those glasses have dark filter lenses) means the Sony ramps backlighting up to ‘maximum'. Other 3D sets adopt a similar approach, but here, it reveals markedly patchy backlighting that's readily apparent in dark scenes – and that's enough to cost it a star. There's no facility to turn down the backlight levels when viewing 3D content either, which might have helped. Sound is as boneless and dismal as we've come to expect from LCD TVs – though the Sony does at least fight shy of the tinfoil zizziness of some lesser designs. In all other respects it's either ‘good' or ‘very good indeed'. 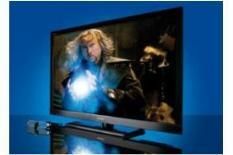 In the space of just a couple of months, the 3D TV market has become extremely competitive.